Where has the old Collectorate gone? 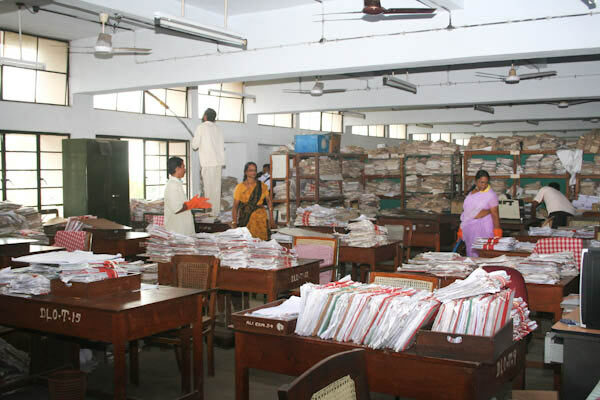 The Collectorate is in Ernakulam – one of the biggest govt. office complexes and frequented daily by many citizens. It occupies an area of about 12 acres, including a big office complex of 5 floors and is enveloped by thick growth of bushes and trees with lots of small and huge objects strewn around, heavily littered with all kinds of garbage. 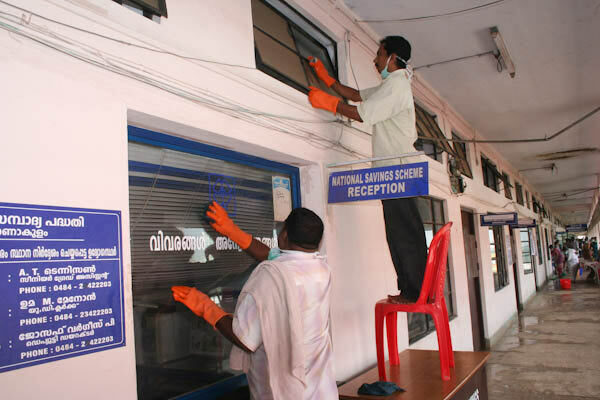 A clean and beautiful Collectorate would serve as a finest example of a clean and beautiful India. And the AmalaBharatam Campaign was up for the task. 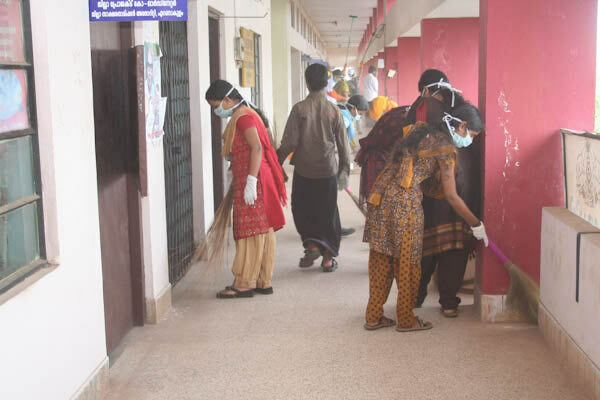 AmalaBharatam Campaign (ABC) is envisioned as a public platform to kindle awareness in the hearts and minds of people and to usher in a new era of cleanliness and hygiene throughout the length and breadth of India. 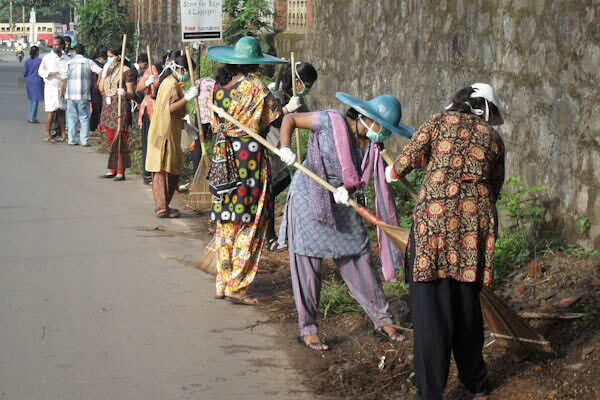 4th Sunday, Clean Sunday is a project under ABC designed to realize our dreams of a clean and beautiful India. Through it, the Public is invited to join together to clean their own premises and serve as an inspiration to others. Nov 28th was to be ABC’s very first 4th Sunday, Clean Sunday. And the setting was the Collectorate for the sevaks of Ernakulam. It turned out to be a major event, beyond all expectations. This was a very finely tuned operation, which went off with clock like precision. For about a week prior, dozens of Amma’s disciples and members of ABC toiled for long hours, planning and organizing this gigantic operation of unprecedented proportions. Lots of help was provided by the sanitation department as well as the forward-looking Collector Beena who was immensely supportive. 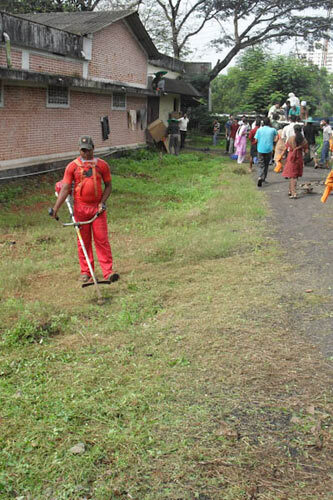 a) To clean up the entire land of about 5.25 lakh square feet square foot by square foot. Mow the grass, pick up garbage, and remove all objects. 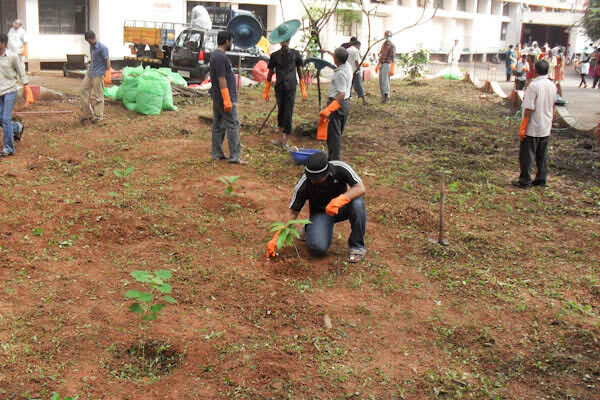 Plant saplings once the area has been cleaned. Sort the waste and put in bags to be buried in pits. c) Clean the public area including roads and wasteland heavily littered with trash. The program began at sharp 7.30 AM with the group from (Amrita Institute of Medical Sciences) AIMS. They consisted of students, professors, and staff from all the various departments. After all the volunteers took the “AmalaBharatam” oath, the program was inaugurated by Dr. Beena the Collector of Ernakulam District. 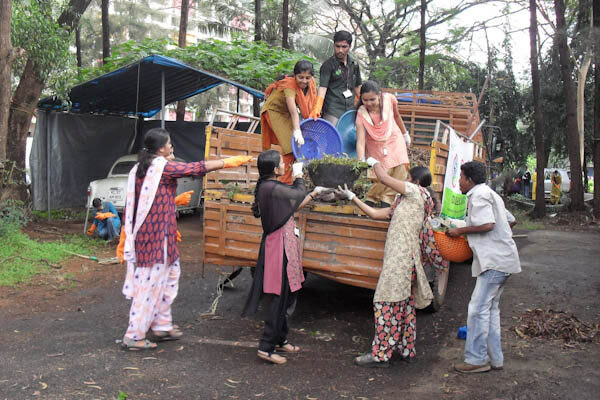 Taking a broom in their hands, Collector Beena and Mayor Tony initiated the first cleaning by collecting the garbage. The early morning crisp breeze was fragrant with the anticipation and joy of the students. Each of the six AIMS groups took up the station allotted to them. Their uniforms of gloves and masks were worn. Tools were taken up. Simultaneously, 1240 pairs of hands started working. As the mercury started rising, the decibel level rose. A JCB, earth-moving machine roared into action. Pickup trucks started plying furiously, busy collecting and dumping trash. Small groups started singing. There are rib-splitting jokes all around. Brushes were scrubbing the wet soapy corridor making a sound like western music. It is a veritable carnival. The work started with the ceiling fans on the top floor. Every inch was cleaned and scrubbed. Even the shelves were dusted and wiped clean. Unwanted books, stationery, and dumped furniture lying around were unceremoniously removed cleaned and disposed off. All the office in-charges of the concerned departments were there to assist and point out areas in need. Even the toilets and the public urinals were not spared the meticulous touch. One cleaning group also had to deal with a snake climbing one of the office walls! The roads you see in the photographs were not taken in Singapore. They are our own Ernakulam roads, just looking dainty and elegant after the Midas touch of ABC! All the rubble and the heaps of earth, pebbles, stones, and boulders had been removed. 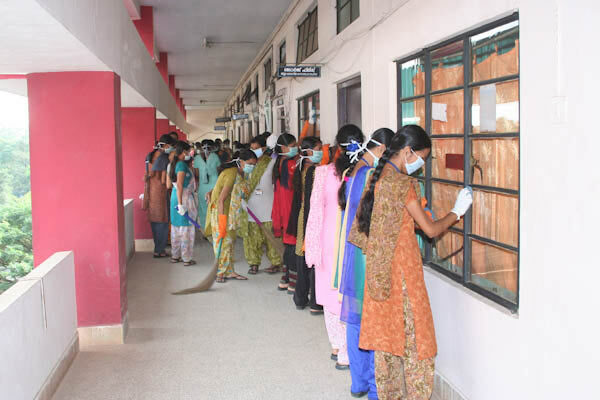 From all parts of the campus, the ubiquitous plastic, organic and metallic waste, paper and what not, were cleared, sorted, and stuffed into trash bags of different colors and disposed off. During the cleanup, there was another surprise in store. While clearing the grounds of the tall dense, growth of bushes in order to plant saplings, what did they encounter? A couple of four wheeled vehicles, which had been buried for years in the growth! The whole program was to end at 11.30 AM, but that was not to be. You had to see it to believe it! The ABC organizers had not foreseen the additional drove of devotees coming forward to participate. 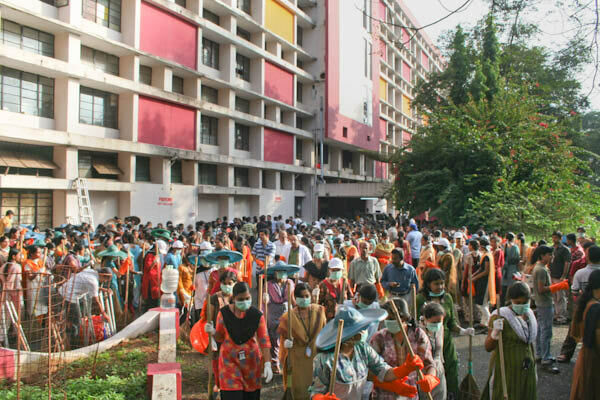 Just as AIMS was wrapping up, 250 newcomers came with renewed enthusiasm, stretching the cleanup till the last minutes of 7.30 PM. Having accomplished their mission, the army was now boarding more than dozen buses back to AIMS. After twelve hours, the curtain fell on the marathon show at 7.30PM. Tired though they were, the rafters of the buses were echoing with songs and joyous laughter of the students. Their garments were drenched in sweat and muscles were aching for little rest, but their eyes were glistening with pride. For they were no amateurs – in the field of selfless service they were veterans! They had done it many times before. Proud of being Indian, they the inveterate messengers of Amma – they are the very future of India. They knew their commitment to ABC, and its new brainchild “4th Sunday, Clean Sunday”. May this act set a new precedent inundating the heart and consciousness of all true Indians.